WELL MAINTAINED MINI FARM! This spacious 3 bedroom, 2 bath manufactured home is sure to please with it&apos;s easy to maintain laminate floors throughout, vaulted ceilings, updated bathrooms, updated island kitchen, wood burning fireplace in the great room, spacious laundry room with extra storage space and room for an upright freezer and a den that could easily convert to another bedroom. Outside enjoy your morning coffee on either the large front deck or the rear covered porch. Lots of storage for your hobbies in the large shed with lean-to. 2 paddocks for horses and an over-sized run in shelter and a nice garden area and lots of pretty shrubs and a variety of fruit trees and more. All this and more privately situated on a 5.87 acre parcel literally just off a paved road. 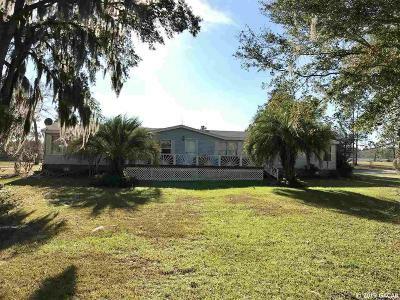 Convenient to Goethe State Forest and an easy drive to Ocala or Gainesville.